Uneasy alliances are formed as Brett Dalton’s Ward is brought back into the fold by Coulson, after a period of inactivity the last few weeks, as they infiltrate the new H.Y.D.R.A. with the help of a brainwashed Bakshi, Whitehall’s lackey and the newly acquired Deathlok! 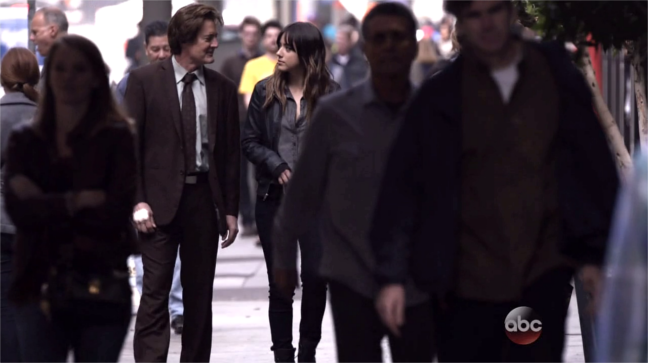 Whilst Chloe Bennet’s Skye tries to make it easier for Cal to be distanced from her and her mother, by spending more time with him. During this, the remaining S.H.I.E.L.D. 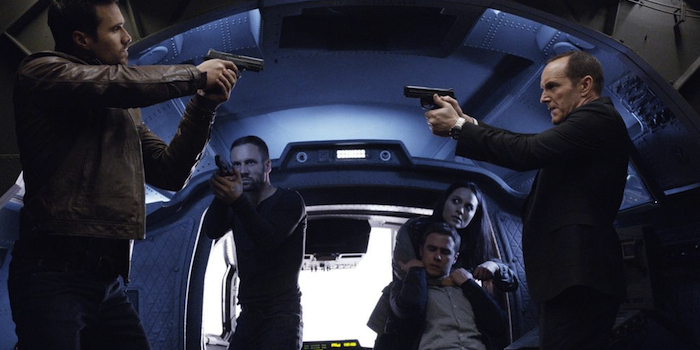 members like Adrianne Pallicki’s Bobbi and Mac doubt their mission and Coulson’s status as their enemy. Simmons and May have a confrontation that leads to the truth about Fury’s toolbox. And all these storylines converges in the final act for an exciting ending that leaves us with no idea of where the rest of the Season is going to go. ‘Agents of S.H.I.E.L.D.’ is truly one of the most exciting television shows on right now due to their very adept blend of action, story, and intense emotional attachment to the characters. Kyle MacLachlin’s portayal of Cal, recalling their past and his failed dreams of a family is so traumatizing that one can’t help but feel empathy for the psychotic killer. Being his most toned down this episode, Cal is a character that I don’t understand why hasn’t become an ally. When you have intentionally self serving Ward being used as an asset, and an apparently trigger happy Deahtlok, who needs to be programmed not to kill everyone, why is no one making an attempt to win over Cal? Especially considering that all his villainous actions were done out of a tragic backstory and love, none of which have reared their ugly head int he last few weeks when he’s been with Skye & Jianying. Yet everyone’s treating him like the plague, which is obviously digging deeper into his wounds and will ultimately prevent him from ever becoming good, or even normalizing. It’s heartbreaking to watch and MacLachlin does it amazingly. Ward’s return brings about a lot of mistrust and anticipation of expected betrayal from his end; so his apparent cooperation actually creates just as much confusion and anxiousness for the audience. Now mix in some mysterious subplot with Skye’s mother and Gordon investigating the fact that H.Y.D.R.A. may be hunting and experimenting on potential Inhumans, and you’ve got a season that’s barreling towards the end with an explosive end.